Mark’s Tuckpointing offers commercial, residential and condominium roofing installation service in the Chicagoland area and surrounding suburbs. 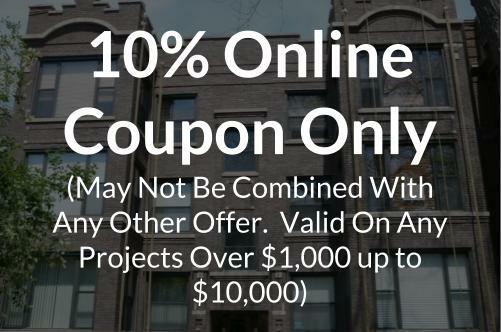 We make buying a new roof easy in Chicago, Illinois. Our professional roofing contractors will guide you through the roofing process and figure out which roofing material is best for your home. We will sit down with you and go though all of your options and answer any questions you have. After you decide on a roof our licensed and certified roofing contractors will start the roofing installation. We finish every project from start to finish and provide the quality service you deserve. Added value – the better the condition your roof is the easier it will be to sell your home in the future. If your roof is maintained and in great condition, a buyer will be more likely to buy your home because then they will not have to spend more on a new roof. Protection – roof repairs will help keep you and your family protected from all types of weather conditions in Chicago, Illinois. Our contractors can inspect your roof and make sure there are not any other problems that will negatively impact your home. Save on energy bills – if your roof is worn down and has drafts, your air conditioner and heater have to work harder to heat and cool your home, causing your energy bills to rise. A roofing repair will help keep your home draft and leak free. The roof is one of the most important features on your Chicago home, business or apartment because it protects you and everyone living in it from all types of weather conditions. Once a roof gets worn down from old age or tattered from bad weather conditions you’ll have no choice but to replace it. Roofing installations can be costly and it’s important to do your research before you have one installed. Mark’s Tuckpointing is a roofing company you can trust! We offer affordable roofing installation prices, quality products and service you can depend on. If you’ve never had a roofing installation done on your Chicago residence, there are a few steps you should know. The first step to a roofing installation is to remove the current roof. Our team will remove the old roof and replace it with the new roofing materials. Before replacing the roof, we will inspect the sheathing. Sheathings are the flat panels under your roofing materials. If there are any spots that are moist or worn down it will need to be repaired. Once we do that, we can start adding on shingles and making sure the roof is securely in place and sealed. Property protection – before you get your roof installed, professionals will make sure everything is protected. Roof removal – Once everything is covered, the roofing contractors can start the removal process of your old roof. Inspect the roof – after your old roof is removed we will inspect your roof. We need to make sure there are no wet spots on your roof or other damages. If so, we will need to repair it. Shingles – the next step would be placing the shingles on the roof. Installation – once the shingles are placed securely, we can install the new roofing materials. Clean up – once the installation is finished our team will clean up the site. Inspection – after everything above has been completed we will do one last inspection and make sure you’re happy with our work! Mark’s Tuckpointing has over 30 years of experience in roofing installations. We are licensed and fully insured. Our thousands of satisfied customers make us the top roofing installation company in the Chicagoland area and the Surrounding Suburbs. You can trust our team to get the job done correctly. If you’re interested in working with Mark’s Tuckpointing for your next roofing installation project contact us for a FREE estimate at 773-831-4444.